Those of us fortunate enough to live and work on the beautiful Sunshine Coast know this region has boundless opportunity for new businesses and the community. We are setting the pace in Queensland – and the region’s success is not going unnoticed. No one is better at identifying emerging economic trends and social shifts than KPMG’s futurist and commentator, Bernard Salt, and he believes the Sunshine Coast’s trajectory is already soaring. Earlier this month he unveiled his latest report, The Activated City: Imagining the Sunshine Coast in 2040, to more than 220 business leaders in Brisbane. They were impressed by his conclusions. By 2040 around 550,000 people will be living on the Coast and our economy will be dynamic and diverse, with huge growth in education, healthcare and professional services and the emergence of new aviation, technology and renewable energy businesses. It won’t just be employment that evolves – we will too. The population will experience a surge in twenty and thirty-somethings, leading to a big bounce in the number of Sunshine Coast kids and even new ‘hipster’ enclaves. What will trigger this change and attract agile and ‘footloose’ businesses and start-ups to the Coast? Mr Salt argues cities need major hospitals, universities, airports and public transport to reach their potential – and the Coast is building them all. 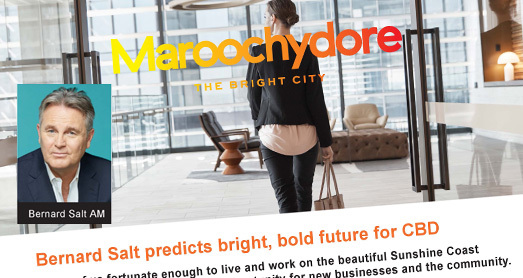 The fifth and final catalyst will be Maroochydore’s new CBD. The report claims the new city centre will provide the perfect business ecosystem, injecting new energy and innovation into the Sunshine Coast. We’ll be just 10 minutes’ drive from the region’s expanding international airport and plans are in place for light rail to connect Maroochydore, the new Kawana health precinct and other key coastal centres by 2025. Our new CBD will be a hub for education, leisure, entertainment and business – a real capital of the Coast. You can see a summary of his presentation (plus an exciting glimpse of the new future CBD) at maroochydore-city.com.au/Bernard-salt We’re creating a new city centre for everyone who calls the Coast home, so please log on and take a look at what the future holds. As always, if you have any questions about the Maroochydore city centre development, you are welcome to email us at dmin@suncentralmaroochydore.com.au or call 07 5452 7274. As always, if you have any questions about the Maroochydore city centre development, you are welcome to email us at dmin@suncentralmaroochydore.com.au or call 07 5452 7274.